This section contains materials on how to use Eskapade. There are additional side notes on how certain aspects work and where to find parts of the code. For more in depth explanations on the functionality of the code-base, try the API docs. All command examples below can be run from any directory with write access. After successfully installing Eskapade, it is now time to run your very first macro, the classic code example: Hello World! Congratulations, you have just successfully run Eskapade! To see what is actually happening under the hood, go ahead and open up tutorials/esk101_helloworld.py. The macro is like a recipe and it contains all of your analysis. It has all the ‘high level’ operations that are to be executed by Eskapade. where self.hello is a parameter set in the __init__ of the class. This setting can be overwritten as can be seen below. For example, we can make another link, link2 and change the default self.hello into something else. Rerunning results in us greeting the famous singer/songwriter. There are many ways to run your macro and control the flow of your analysis. You can read more on this in the Short introduction to the Framework subsection below. Now that we know the basics of Eskapade we can go on to more advanced macros, containing an actual analysis. If you want to add command line arguments, for example to change the output logging level, read the page on command line arguments. There is a lot more output than these lines (tens or hundred of lines depending on the log level). Eskapade has run the code from each link, and at the top of the output in your terminal you can see a summary. When you look at the output in the terminal you can see that the macro contains two chains and a few Link are contained in these chains. Note that chain 2 is empty at this moment. In the code of the macro we see that in the first chain that data is loaded first and then a transformation is applied to this data. Before we are going to change the code in the macro, there will be a short introduction to the framework. At this point we will not go into the underlying structure of the code that is underneath the macro, but later in this tutorial we will. For now we will take a look in the macro. So open $TUTDIR/tutorial_1.py in your favorite editor. We notice the structure: first imports, then defining all the settings, and finally the actual analysis: Chains and Links. and registered automatically with the ProcessManager. The ProcessManager is the main event processing loop and is responsible for processing the Chains and Links. This means the Link is added to the chain and when Eskapade runs, it will execute the code in the Link. Now that we know how the framework runs the code on a higher level, we will continue with the macro. But for now, we will skip the underlying functionality of the links. Let’s do an exercise. Going back to the first link, we notice that the transformations that are executed are defined in conv_funcs passed to the link. We want to include in the plot the wind speed in km/h. There is already a part of the code available in the conv_funcs and the functions comp_date and mi_to_km. Use these functions as examples to write a function that converts the wind speed. Add this to the transformation by adding your own code. Once this works you can also try to add the temperature in degrees Celsius. The command will make a link object named YourLink in the path specified in the first argument. The link we wish to add will do some textual transformation, so name it accordingly. And be sure to follow the instructions given by the command! This skeleton file can be modified with your custom editor and then be imported and called inside a macro with analysis.YourLink(). Notice that the name of the class is CamelCase and that the name of the file is lowercase to conform to coding guidelines. to get the DataFrame that includes the latest transformations. Now we are going to make a completely different transformation in the Link and apply it to the object in the DataStore. We want to add a column to the data that states how humid it is. When column ‘humidity’ is less than 50 it is ‘dry’, otherwise it is ‘humid’. You will have to use some pandas functionality or perhaps something else if you prefer. Save the new column back into the DataFrame and then put the DataFrame in the DataStore under the key ‘data_new’. We are going to let our plot functionality loose on this DataFrame once more, to see what happens to our generated textual data. It can not be plotted. In the future this functionality will be available for most data types. If you have pdflatex installed on your machine. In summary, the work method of Eskapade is to run chains of custom code chunks (links). Each chain should have a specific purpose, for example pre-processing incoming data, booking and/or training predictive algorithms, validating these predictive algorithms, evaluating the algorithms. By using this work method, links can be easily reused in future projects. Some links are provided by default. For example, links used to load data from a json file, book predictive algorithms, predict the training and test data set and produce evaluation metrics. If you want to use your own predictive model just go ahead and add your own links! makes a new macro from a template macro. When we open the macro we find a lot of options that we can use. For now we will actually not use them, but if you want to learn more about them, read the Examples section below. First we will add new chains to the macro. These are the higher level building blocks that can be controlled when starting a run of the macro. At the bottom of the macro we find a commented out Link, the classic Hello World link. You can uncomment it and run the macro if you like, but for now we are going to use the code to make a few chains. When naming chains, remember that the output of Eskapade will print per chain-link combination the logs that are defined in the Links. So name the chains appropriately, so when you run the macro the logging actually makes sense. This tutorial will be quite straight-forward, it has 3 short steps, which is why we made 3 chains. In the first chain: Read a data file of your choosing into Eskapade using the pandas links in the analysis subpackage. In the second chain: Copy the DataFrame you created in the DataStore using the core_ops subpackage. In the third chain: Delete the entire DataStore using a Link in the core_ops subpackage. To find the right Links you have to go through the Eskapade documentation (or code! ), and to find within its subpackages the proper Links you have to understand the package structure. Every package is specific for a certain task, such as analysis, core tasks (like the ProcessManager), or data quality. Every subpackage contains links in its links/ subdirectory. See for example the subpackages core_ops, analysis or visualization. In All available examples we give some tips to find the right Links your analysis, and how to configure them properly. This section contains materials on how to use Eskapade in Jupyter Notebooks. There are additional side notes on how certain aspects work and where to find parts of the code. For more in depth explanations, try the API-docs. Next we will demonstrate how Eskapade can be run and debugged interactively from within a Jupyter notebook. # --- To rerun eskapade, clear the memory state first! Make sure to fill out all the necessary parameters for it to run. The macro has to be set obviously, but not all settings in this example are needed to be set to a value. The function execution.eskapade_run(settings) runs Eskapade with the settings you specified. The import_from_file function imports a pickle file that was written out by Eskapade, containing the DataStore. This can be used to start from an intermediate state of your Eskapade. For example, you do some operations on your DataStore and then save it. At a later time you load this saved DataStore and continue from there. In this tutorial we will make a notebook and run the macro from tutorial 1. This macro shows the basics of Eskapade. Once we have Eskapade running in a terminal, we can run it also in Jupyter. Make sure you have properly installed Jupyter. This will create a notebook in the current directory with the name tutorial_3_notebook running macro tutorial_1.py. You can set a destination directory by specifying the command argument --dir. Now open Jupyter and take a look at the notebook. In Jupyter to find which path you are working on, and put the data to the path. Or change the load path in the macro to the proper one. But in the end it depends on your setup. Intermezzo: you can run bash commands in Jupyter by prepending the command with a ! 2017-02-14 14:04:55,507 DEBUG [readtodf/pandasReader]: using Pandas reader "<function _make_parser_function.<locals>.parser_f at 0x7faaac7f4d08>"
And try to rerun the notebook without restarting the kernel. is the DataStore, and similarly the other ‘master’ objects can be called. Resetting will clear the process manager singleton from memory, and now the macro can be rerun without any errors. Note: restarting the Jupyter kernel also works, but might take more time because you have to re-execute all of the necessary code. Where $MACRO is the macro name you specified in the settings, $VERSION is the version you specified and latest refers to the last chain you wrote to disk. By default, the version is 0 and the name is v0 and the chain is the last chain of your macro. You can write a specific chain with the command line arguments, otherwise use the default, the last chain of the macro. Now we are going to load the pickle from tutorial_1. We see there are two keys: data and transformed_data. Call one of them and see what is in there. You will find of course the pandas DataFrames that we used in the tutorial. Now you can use them in the notebook environment and directly interact with the objects without running the entirety of Eskapade. one can import the saved singleton at the path. The singleton can be any of the above mentioned stores/objects. Finally, by default there are soft-links in the results directory at results/$MACRO/proc_service_data/$VERSION/latest/ that point to the pickles of the associated objects from the last chain in the macro. The script will create a Python package called yourpackage in the path specified in the --project_root_dir argument. The arguments -m, -l, and -n are optional, if not specified the default values are used. The project contains a link module called yourlink.py under links directory, a macro yourmacro.py, and a Jupyter notebook yournotebook.ipynb with required dependencies. To add more of each to the project you can use the commands generate_link, generate_macro, and generate_notebook like it was done before. The script also generates setup.py file and the package can be installed as any other pip package. As you can see in the output, installation checks if eskapade and its requirements are installed. Now run the cells in the notebook and check if the macro runs properly. This section contains materials on how to use Eskapade in to re-simulate data. We will explain how to use the links present in the submodule and what choice were made. A dataset is simulated containing mixed data types, representing general input data. We’ll go through each of the links and explain the workings, choices made and available options so to help facitilitate the use after a client engagement. When providing the map for ordered catagorical variables, you also need to add them for the unordered catagorical variables which are strings. The macro will either create maps for all string variables, or will use the provided maps input. Addionally, you need to provide the macro with the data type contained in each column, ordered-, and unordered catagorical, or continuous. Finally also provide the columns which contain strings, so the macro will transfer them to numerical values. In case of ordered catagorical values this will happen using the maps you mentioned above. If it is not provided, the macro will automatically create a map and add it to the datastore. The automatically created map does not take any implicit order of catagories into account. ds['bw'] in Resampler is a list of bandwidths estimated by the kde corresponding to the columns of the data as stored in ds. The first link exists to create some fake data to run the tutorial macro on. Naturally, if you want to run the data_mimic to resimulate a specific dataset, this link is not necessary. The link takes some parameters as input that will determine how the data is generated, such as the number of observations, the probabilities associated with each category per dimension, and the mean stds for the coninuous data. Each of these transformations are saved to the datastore including their properties needed to transform the data back. This link performs the actual KDE. The link takes the normalized data in case of the continuous variables, and the data without NaN values for catagorical variables. It then applies the KDEMultivariate implementation from statsmodels, using the ‘normal-rule-of-thumb’ for quick calculation. There is a faster method available if only unordered variables are present. This method is selected automatically. The result is a bandwidth bw for each variable, which are saved in a list in the datastore. Resamples a new point from a normal distribution centered at the original datapoint, with std=bw[j], for continuous varibales. Resamples randomly from all catagories != current catagory if bw[j] > np.random.rand() for unordered catagorical variables. Resamples using a Wang-Ryzin kernel defined at the datapoint using bandwith bw[j] for ordered catagorical variables. Evaluates the distribution similarities based on Chi-square, Kolmogorov-Smirnov and the Cosine distance. The formulas and applications of these metrics to the datset are explained below. When applying the two sample chi-square test we are testing whether two datasets come from a common distribution. where R is the resampled dataset and E the expected values, or in our context, the original dataset. The Kolmogorov–Smirnov test may also be used to test whether two underlying one-dimensional probability distributions differ. In this case, we apply the KS test to each variable and save the results. The KS test assumes the distribution is continuous. Although the test is run for all variables, we should keep this in mind when looking at the results for the catagorical variables. If the K-S statistic is small or the p-value is high, then we cannot reject the null-hypothesis that the distributions of the two samples are the same. Aka: They are sufficiently similar to say they are from the same distrubution. We also tried to define a distance from the original dataset to the resampled one. We employ the cosine distance applied to each point and its resampled point, represented as a vector. The distance will be 0 when on top of each other, and the max distance is. We define a vector as the combination of all variables for one datapoint (or row in your dataset). All ordered catagorical values are mapped to numerical values going from 0 to # of catagories available, where 0 corresponds to the lowest ranking catagory. All unordered catagorical are ignored for now since we have not yet defined a sufficient distance measure for these. Then, the cosine distance is calculated for each point and it’s corresponding resample. Each variable page also contains the chi-square values comparing before and afer the resampling (also see Chi-square). For each variable, there is a table containing several values. The values correspond the chisquare calculation done on a 1D histogram of the variable itself, and done on 2D histograms of two variables as listed in the table. The value 1.22 corresponds to the calculation variable d before and after the resampling. The value of 1034.82 corresponds to the calculations done on a 2D histogram of variables d and e, before and after the resampling. Finally, two other metrics, the Kolmogorov-Smirnov and the cosine distance, are also calculated and shown in the report. You can find these on the last page. esk100+: basic macros describing the chains, links, and datastore functionality of Eskapade. esk200+: macros describing links to do basic processing of pandas dataframes. esk300+: visualization macros for making histograms, plots and reports of datasets. esk500+: macros for doing data quality assessment and cleaning. esk700+: macros for doing data simulation. The Eskapade macros are briefly described below. They explain the basic architecture of Eskapade, i.e. how the chains, links, datastore, and process manager interact. Hopefully you now have enough knowledge to run and explore Eskapade by yourself. You are encouraged to run all examples to see what Eskapade can do for you! Macro 101 runs the Hello World Link. It runs the Link twice using a repeat kwarg, showing how to use kwargs in Links. Macro 102 uses multiple chains to print different kinds of output from one Link. This link is initialized multiple times with different kwargs and names. There are if-statements in the macro to control the usage of the chains. Macro 103 has some objects in the DataStore. The contents of the DataStore are printed in the standard output. Macro 104 adds some objects from a dictionary to the DataStore and then moves or deletes some of the items. Next it adds more items and prints some of the objects. C starts at the 3rd chain of the macro. Using these examples one can see how the way macro’s are run can be controlled and what it saves to disk. Macro 106 shows us how command line arguments can be used to control the chains in a macro. By adding the arguments from the message inside of the macro we can see that the chains are not run. Example 107 adds a chain to the macro and using a repeater Link it repeats the chain 10 times in a row. Example 108 processes a textual data set, to loop through every word and do a Map and Reduce operation on the data set. Finally a line printer prints out the result. This macro illustrates basic debugging features of Eskapade. The macro shows how to start a python session while running through the chains, and also how to break out of a chain. This macro demonstrates how to run Eskapade with code profiling turned on. Macro illustrates how to load an external datastore from file. Macro 202 illustrate writing pandas dataframes to file. It reads a DataFrame into the data store and then writes the DataFrame to csv format on the disk. This macro performs the vectorization of an input column of an input dataframe. E.g. a columnn x with values 1, 2 is tranformed into columns x_1 and x_2, with values True or False assigned per record. This macro performs the factorization of an input column of an input dataframe. E.g. a columnn x with values ‘apple’, ‘tree’, ‘pear’, ‘apple’, ‘pear’ is tranformed into columns x with values 0, 1, 2, 0, 2. Macro to that illustrates how to loop over multiple (possibly large!) datasets in chunks. Macro to illustrate writing pandas dataframes to file and reading them back in whilst retaining the datatypes and index using numpy and feather file formats. Macro that illustrates how to loop over multiple (possibly large!) 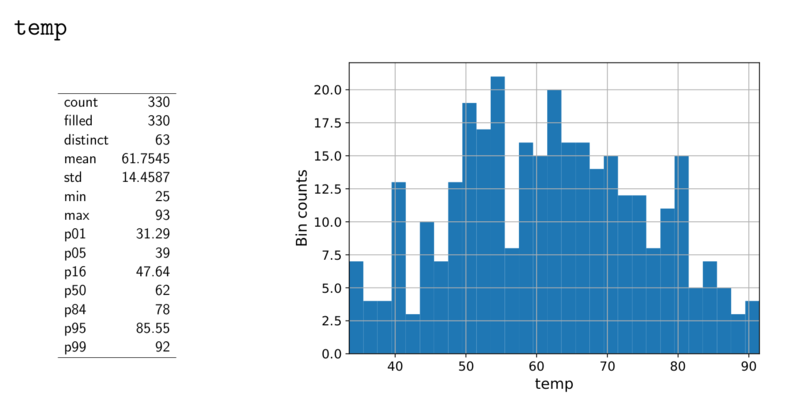 datasets in chunks, in each loop fill a (common) histogram, and plot the final histogram. Macro that illustrates how to loop over multiple (possibly large!) datasets in chunks, in each loop fill a histogrammar histograms, and plot the final histograms. Macro shows how to boxplot the content of a dataframe in a nice summary pdf file. Macro to demonstrate generating nice correlation heatmaps using various types of correlation coefficients. This macro illustrates how to concatenate the reports of several visualization links into one big report. Fix all column names. Eg. remove punctuation and strange characters, and convert spaces to underscores. Per column, assess dynamically the most consistent datatype (ignoring all nans in that column). Eg. bool, int, float, datetime64, string. This macro illustrates how to resample an existing data set, containing only unordered catagorical data, using kernel density estimation (KDE) and a direct resampling technique. This section contains a general description on how to use Eskapade in combination with other tools, in particular for the purpose of developing code. PyCharm is a very handy IDE for debugging Python source code. It can be used to run Eskapade stand-alone (i.e. like from the command line) and with an API. Install PyCharm on your machine. You should now be able to press the ‘play button’ to run Eskapade with the specified parameters. Running the framework works best from the command line (in our experience), but running experiments and trying new ideas is better left to an interactive environment like Jupyter. How can we reconcile the difference in these work flows? How can we use them together to get the most out of it? Import the DataStore and/or ConfigObject. Once you have imported the ConfigObject, run it to generate the output you want to use. Grab the data you want from the DataStore using ds = DataStore.import_from_file and data = ds[key]. Now you can apply the operation you want to do on the data, experiment on it and work towards the end result you want to have. Create a new link in the appropriate link folder using the eskapade_generate_link command. Copy the operations (code) you want to do to the link. Add assertions and checks to make sure the Link is safe to run. Add the Link to your macro and run it! These steps are very general and we will now go into steps 5, 6 and 7. Steps 1, 2, 3 and 4 have already been covered by various parts of the documentation. So assuming you wrote some new functionality that you want to add to a Link called YourLink and you have created a new Link from the template we are going to describe how you can get your code into the Link and test it. Test if the Link has the desired effect. We continue with a longer description of the steps above. In the __init__ you specify the key word arguments of the Link and their default values, if you want to get an object from the DataStore or you want to write an object back into it, use the name read_key and store_key. Other keywords are free to use as you see fit. In the initialize function in the Link you define and initialize functions that you want to call when executing the code on your objects. If you want to import something, you can do this at the root of the Link, as per PEP8. Now you can call the objects that contain all the settings and data of the macro in your Link, and in the code below you can add your analysis code that calls from the objects and writes back in case that this is necessary. Another possibility is writing a file to the disk, for example writing out a plot you made. to reload the link you changed. This is equivalent to the Python2 function reload(eskapade). Combined with the importing of the other objects it becomes clear that you can run every piece of the framework from a notebook. However working like this is only recommended for development purposes, running an entire analysis should be done from the command line. Finally after finishing all the steps you use the function finalize() to clean up all objects you do not want to save. After testing whether the Link gives the desired result you have to add the proper assertions and other types of checks into your Link code to make sure that it does not have use-cases that are improperly defined. It is advised that you also write a unit test for the Link, but unless you want it merged into the master, it will not be enforced. Now you can run Eskapade with your macro from your command line, using the new functionality that you first created in a notebook and then ported into a stand-alone Link.